Good Afternoon! It's a dreary one here in RBNY Land. No matter, as the Red Bulls are in the land where the sun (almost) never shines (Seattle) for a massive, massive league tilt against the Sounders (10:00pm ET, ESPN2). The Sounders are opening all of the seats, of their just-renamed stadium for this one, so the atmosphere should be insane. Let's see how the two teams come into this one. Seattle is coming off a 90th minute away win, against a hapless Toronto FC side, and are currently third in the Western Conference. At their last home game, the Sounders were done in by a stunning bomb of a goal, by Vancouver's Eric Hassli. It wasn't a loss, but it sure must have felt like one. With a massive crowd on their side today (43,000 tickets sold, as of Monday) they'll be looking to stuff RBNY. I'd love to predict three points here, but that would take larger cojones than I have. Missing Henry and Rodgers (and Ream and Marquez and Agudelo), it's hard to predict anything but a loss in Seattle. 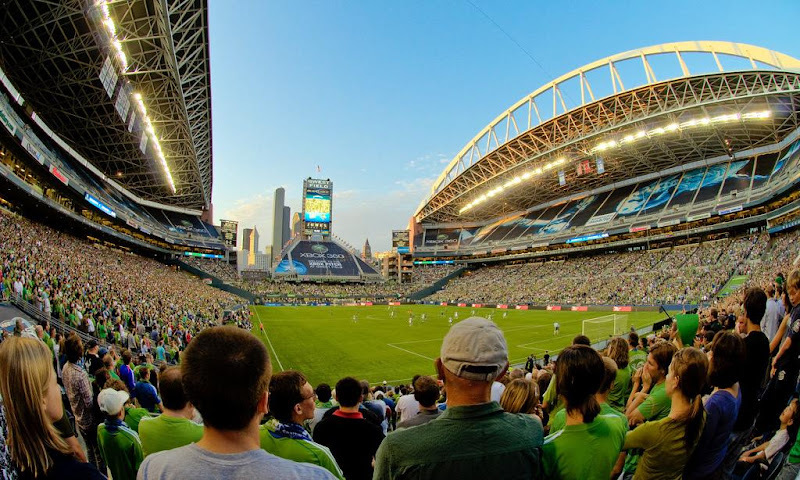 The Sounders will have a massive 40,000+ crowd behind them and I can't see the likes of Stephen Keel and Carlos Mendes coping too well with it. Add in Greg Sutton's shaky form and you have the recipe for conceding goals. I do think we have the ability to attack with pace and get behind defenders now that Richards is back but it probably won't be enough. 2-1 Sounders, which wouldn't exactly be a disaster. A goal for Richards, while Montero gets a brace for Seattle. I'm going to predict that the Red Bulls can get out of the CLink with a 1-1 tie. Yeah, that's me being as positive as I can be, at the moment. It's very difficult to predict a positive result tonight, with no natural forwards, and our backline woes. Thankfully, we get Dane Richards back from the Jamaican national team to help provide cover. I'm pretty much writing this one off and looking forward to the return of our full team following the Gold Cup final this weekend. 3-1 Seattle. Seattle scores off an own goal by Keel, a PK off a penalty by Keel, and Montero nutmegging Keel. Dane Richards will look good playing up top and tallies our lone goal. The recurring theme this season has been that things rarely go the way they seem they should. So even with our centerbacks giving up dumb goals, even with Greg Sutton cementing his feet to the ground on set pieces, and even with neither of our main strikers starting, I can see us escaping with at least a point. In fact, because Seattle has been less than dominant at home this season (3-2-3), I'm going to go out on a limb and call this a 1-0 win for the Red Bulls on a DeRo goal. That's all for now. Look for Award Winning coverage in the next day, or two. Viper Out!